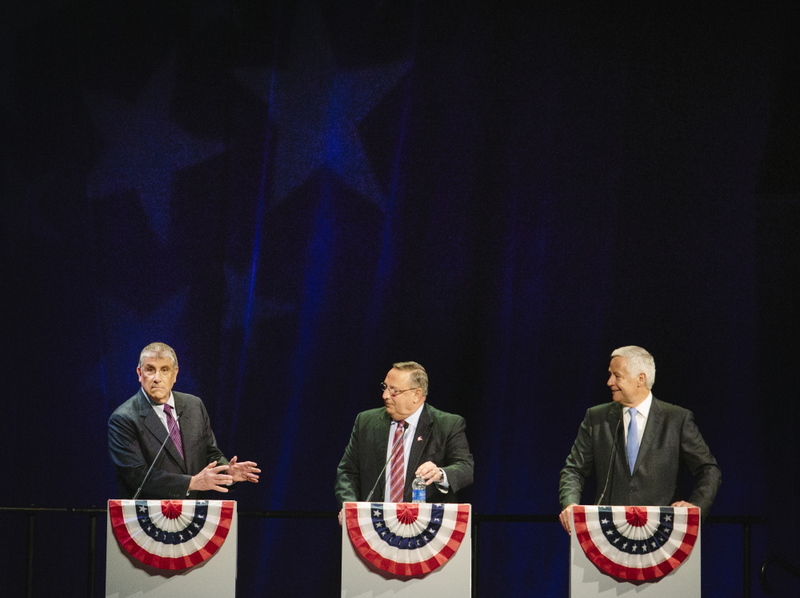 Maine’s three gubernatorial candidates repeated claims they made in the two previous debates and unveiled a few new ones in their first televised debate Wednesday night in Augusta. Here’s how some of their statements stood up to a Portland Press Herald fact check. Duncan’s treatment has come under scrutiny, but not because health care workers in Dallas gave him aspirin. They gave him antibiotics, but not the experimental drug Zmapp that is being used to treat the deadly disease and had been prescribed to American patients Kent Brantly and Nancy Writebol. The two Americans survived. Duncan did not. 2. Republican Gov. Paul LePage appeared to stray from the truth when he answered a question about background checks for firearms sales. 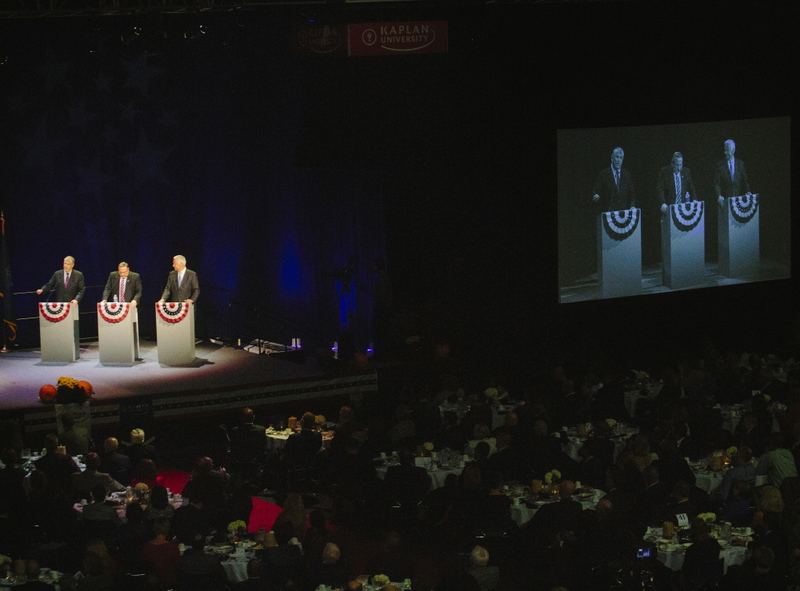 During the lightning round, the candidates were asked if they would support criminal background checks on private gun sales. Michaud and Cutler said yes, as long as there’s an exemption for family members. It’s unclear why the governor believes a law instituting background checks on private gun sales would require a constitutional amendment. During the 126th Legislature, lawmakers killed L.D. 1240, a bill that would have instituted a number of changes to private gun sales, including background checks. That proposal would not have required a constitutional amendment. 3. Independent Eliot Cutler accused Michaud of accepting “thousands” in campaign contributions from agricultural-giant Monsanto and then voting in its favor. He cited Michaud’s 2006 vote for H.R. 4167, the National Uniformity of Food Act, which passed the House, but died in the Senate. Cutler said the bill would have prevented Oakhurst Dairy from labeling its products as free of artificial hormones. But Monsanto was not a registered lobbyist for the 2006 bill, according to the Center for Responsible Politics, making it unlikely Michaud conferred with the company before voting. And while Monsanto has given $4,000 to Michaud since 2002, it did not give him money in 2006. According to GovTrack, which tracks congressional legislation, the 2006 bill would have required uniform food labeling, except in certain cases. Michaud voted for the bill, while fellow Democrat U.S. Rep. Tom Allen, representing Maine’s 1st Congressional District, voted against it. Monsanto, which makes Posilac to increase milk production in cows, sued Oakhurst in the years before the vote for implying on its labels that GMO free milk was healthier than other milk, when the Food and Drug Administration had ruled there was no difference. Oakhurst reached a settlement with Monsanto in 2003. Michaud pointed out he is currently a co-sponsor of a GMO labeling bill. 4. LePage made two claims about Medicaid expansion that deserve a second look. He asserted that people are getting better health coverage from commercial insurance offered through the federal exchange established under the Affordable Care Act than they would through Medicaid. However, the governor failed to mention that many low-income families cannot afford insurance on the federal exchange. Since the ACA anticipated that states would expand Medicaid, these families are not eligible for federal subsidies. The U.S. Supreme Court ruled that the federal government could not force states to expand their Medicaid programs, leaving many people unable to afford coverage. The second claim is that only 20,000 people are eligible for Medicaid expansion, not 70,000. LePage held up a blown-up version of a letter he said was from the U.S. Centers For Disease Control and Prevention proving his point. His staff did not respond to several requests from the Portland Press Herald earlier Wednesday for a full copy of the letter, which he has referenced at previous debates. The Maine Hospital Association and its 38 member hospitals support expansion, because the federal government will pay between 90 percent and 95 percent of the costs for the newly covered, many of whom currently receive free care. In an October 2013 policy paper, the MHA says that hospitals lost $33 million because Maine has not expanded Medicaid. Over 10 years, the MHA predicts they will lose $900 million. 5. Michaud repeated his claim that LePage and the Legislature passed a $400 million tax cut package in 2011 that was “outside the budget cycle.” Republicans have called the claim false. LePage is correct that the tax cuts passed in 2011 were included in the state’s biennial budget and within the budget cycle. The tax cuts began going into effect Jan. 1, 2012, and the larger tax break went into effect Jan. 1, 2013. When Michaud says that the tax cut was outside of the budget cycle, he’s essentially saying that the tax package wasn’t entirely paid for in 2011. He’s partially correct. Approximately $59 million in tax relief began taking effect in January 2012 and the larger share went into effect later when the state encountered a budget gap. The budget deficit was partially driven by the tax cut package, which LePage and the next Legislature were forced to address in 2013. LePage’s budget proposal called for a $200 million cut in aid to municipalities, which was one of several measures designed to protect the 2011 tax cut package. Michaud’s main criticism is that LePage cut aid to municipalities to pay for the tax cuts.